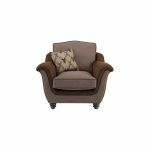 The spacious and comfortable Galloway armchair in Coffee with Almudar Stag Scatter is the perfect retreat after a long day. Boasting a plump, fibre-filled cushion and a striking scatter cushion for a laid-back finish, you can truly sit back and relax in luxury comfort. The classic shape and subtle rustic-inspired detailing make it a great addition to any office, bedroom, or living room. Solid hardwood is used in the frame, which also features screwed, glued and pinned joints, ensuring the Galloway armchair will maintain its quality look and feel for years to come. Browse the entire Galloway range and find complementary pieces for your dream living room.